This family sized terraced Georgian cottage in the heart of the city was built around 1700 of the honey-coloured stone for which Bath is famous. It started its life as an ale house by the name of "Darby and Joan" and is featured in a publication named "Lost Pubs Of Bath". 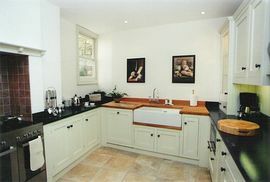 Over the years it has seen many owners all of whom have updated and improved it, not least of which are the present new owners who have completely transformed the house, upgrading the kitchen and providing a new shower room, study and utility room and redecorating throughout. Now, visitors staying here on lower Lansdown slopes can have the benefit of their own front door located less than five minutes walk from the main shopping area of Milsom Street and within a short walking distance of a myriad of restaurants, bars, and city sights. There are three storeys: the street level has now been altered to provide a large through kitchen-diner, with new fitted units, and a comprehensive range of new equipment, this is a room you will want to live in! A cloakroom off the hall has a shower, lavatory and wash basin. There is a small study and a fully equipped laundry room. 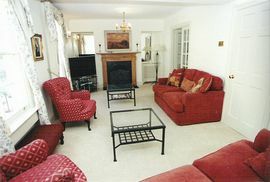 Relaxing space on the first floor is light and airy, and provides a through L-shaped sitting room, with sofas, easy chairs, lamps, mirrors, pictures and a large screen television. There is a single bedroom on this floor. The top floor provides a double bedroom with king sized bed, and en-suite shower room, a compact twin bedroom, a single bedroom and a large smart family bathroom. Windows on this upper floor give enticing glimpses of the beautiful city and surrounding hills. 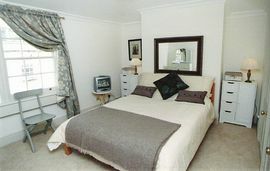 The whole house is tastefully decorated with pastel colours throughout and very well furnished and equipped. 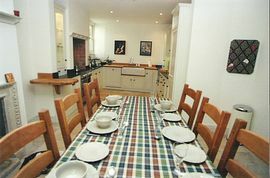 Previous visitors have appreciated the convenient location, with easy access to all facilities in the centre of Bath including the recently opened Bath Spa. Future visitors will appreciated the enhanced standard of presentation. £800.00 per week every week of the year.